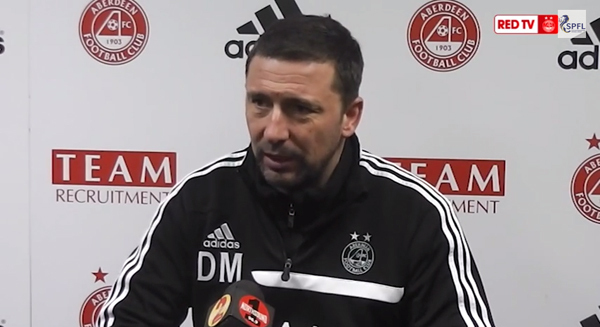 Dons boss Derek McInnes has just spoken to the media in the build-up to Sunday's titanic clash between Aberdeen and Celtic. Here's what he had to say. Derek - We've worked hard to be on the run we're on and we'll need to show all our qualities on Sunday. Derek - Clean sheets have been encouraging but it's not just down to the keeper & back four. Derek - The crowd are always important and, being almost a full house, will give the guys a lift. Derek - Shay will have no problem on Sunday and his performances have been great since Celtic. Derek - For anyone to say Tonev didn't say anything is wrong but I would always expect teammates to defend each other. Derek - So much to look forward to for Sunday. Russell & Nicky still out.